Hypothermia: Body temperature below the normal range. Normal body temperature is around 37 °C (98.6 °F). Hypothermia occurs as the body temperature falls lower than normal; usually below 35 °C (95 °F). Hypothermia occurs when the body fails to produce heat during metabolic processes, in cells that support vital body functions. Most heat is lost from the skin’s surface through convection, conduction, radiation, and evaporation. When the body temperature drops, the heart, nervous system and other organs can’t work normally leading to complete failure of the heart and respiratory system and eventually to death. Hypothermia can be classified as inadvertent (seen postoperatively), intentional (for medical purposes), or accidental (exposure related). Inadvertent perioperative hypothermia is a common consequence of anesthesia. Intentional hypothermia is an induced state generally directed at neuroprotection after an at-risk situation usually after cardiac arrest. Accidental hypothermia usually results from sudden exposure in an inadequately prepared person such as an inadequate shelter for a homeless person or someone exposed in a winter storm or motor vehicle accident. Older adults are particularly exposed to accidental hypothermia due to age-related changes in normal thermoregulation. Patient maintains a core body temperature above 35°C (95°F). Patient manages HR and BP within normal limits; skin is warm. 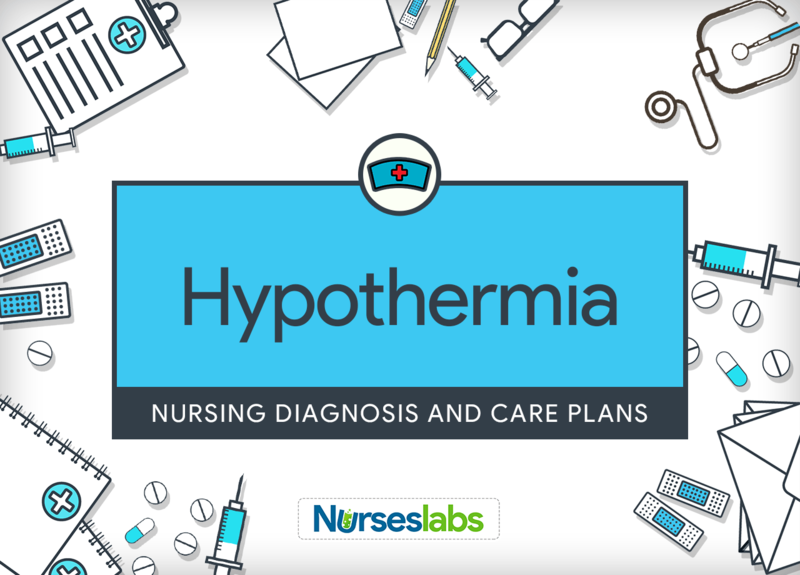 Assessment is required in order to distinguish possible problems that may have lead to Hypothermia. Assess for precipitating situations and risk factors. Causative factors guide the appropriate treatment. Older patients have a decreased metabolic rate and reduced shivering response; therefore the effects of cold may not be immediately manifested. Note and monitor patient’s temperature. For alert patients, oral temperature is regarded as more reliable than tympanic or axillary. For hypothermic patients, core temperature can be monitored using a temperature-sensitive pulmonary artery catheter or bladder catheter. Monitor the patient’s HR, heart rhythm, and BP. HR and BP drop as hypothermia progresses. Moderate to severe hypothermia increases the risk for ventricular fibrillation, along with other dysrhythmias. Evaluate the patient for drug abuse use, including antipsychotics, opioids, and alcohol. These groups of drugs contribute to vasodilation and heat loss. Evaluate the patient’s nutrition and weight. Poor nutrition contributes to decreased energy reserves and restricts the body’s ability to generate heat by caloric consumption. Assess the patient’s peripheral perfusion at frequent intervals. Hypothermia initially precipitates peripheral vascular constriction as a compensatory mechanism to minimize heat loss from extremities. The patient’s skin will look pale and cool to the touch with delayed capillary refill. As hypothermia advances, vasodilation transpires, furthering heat loss. The patient’s skin becomes warm and less pale. The patient may start to remove clothing and bed covers. Monitor fluid intake and urine output (and/or central venous pressure). Decreased output may indicate dehydration or poor renal perfusion. Avoid fluid overload to prevent pulmonary edema, pneumonia, and taxing an already compromised cardiac and renal status. Check for electrolytes, arterial blood gases, and oxygen saturation by pulse oximetry. Acidosis may emerge from hypoventilation and hypoxia. Evaluate for the presence of frostbite, if the patient has had prolonged exposure to a cold environment. Severe hypothermia generates ice crystals to form inside cells. The cells eventually burst and die. Assess the patient’s readiness to reach a toileting facility, both independently and with assistance. This allows the nurse to plan for assistance. Assess the patient’s typical pattern of urination and occurrence of incontinence. This information is the source for an individualized toileting program. Regulate the environment temperature or relocate the patient to a warmer setting. Keep the patient and linens dry. These methods provide for a more gradual warming of the body. Rapid warming can induce ventricular fibrillation. Moisture promotes evaporative heat loss. Control the heat source according to the patient’s physical response. Body temperature should be raised no more than a few degrees per hour. Vasodilation occurs as the patient’s core temperature increases leading to a decrease in BP. Hypotension, metabolic acidosis, and dysrhythmias are complications of rewarming. Give extra covering (passive warming), such as clothing and blankets; cover postoperative patients with heat-retaining blankets. Warm blankets provide a passive method for rewarming. Give heated oral fluids for alert patients. Warm fluids produce a heat source. These measures raise the core temperature and improve circulation. Core warming is indicated when body temperature is below 30 °C (86 °F). Avoid manually rubbing, scrubbing, or massaging areas of frostbite. Rubbing can further damage frozen tissue. Explain all procedures and treatment to the patient and SO. Repeated explanations are needed to avoid confusion.